We are by no means experts when it comes to cooking typical Peruvian food, or comida criolla, but yesterday our papa rellenas actually came out looking good. 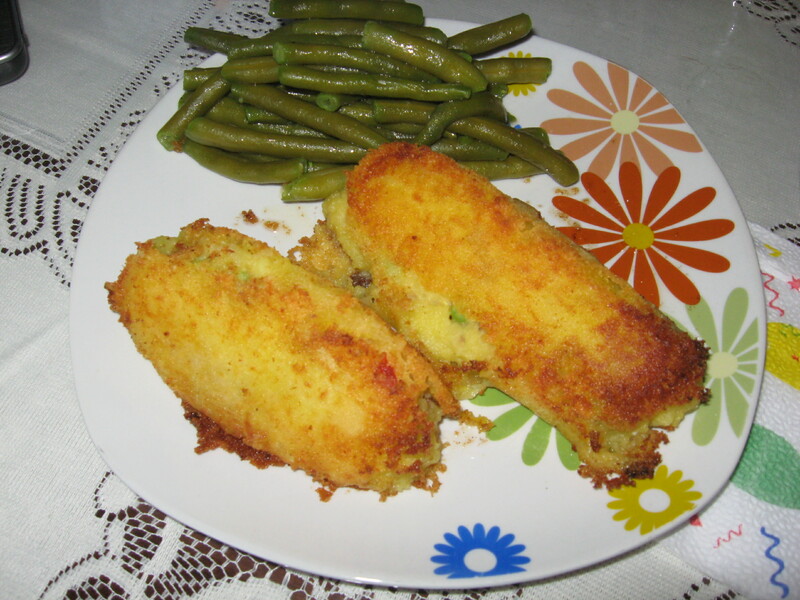 Papa rellenas are typical Peruvian food, served often at the local restaurants that offer daily specials known as “Menu”. So how do you make papa rellena? Again, I’m no expert, but basically you make mashed potatos and roll them around some ground beef and vegetables like peas, carrots, peppers – all cooked and cut into small pieces, of course. Then you fry the rolled potato in a pan to make it crispy brown on the outside, yummie!! This entry was tagged comida criolla, food, papa rellena, Peruvian food. Bookmark the permalink. hello, I´ve been reading your website…very interesting. And thought I´d add to your papa relleno recipe that before you shallow fry dip the ´balls´ into egg that has been beaten before. man that sure looks yummilicious! bet it tastes twice as good! I often have trouble with the potato staying together while frying it, maybe dipping into egg will help. That’s pretty much the extent of my cooking skills: everything’s an experiment! I’m sure if you look up how to make these correctly, you’ll have no trouble cooking up your own papa rellenas soon.